I had a couple of guests from abroad who have never had Thai food before though they have traveled to Thailand more than five times. This year, I persuaded them to explore Thai cuisine successfully. 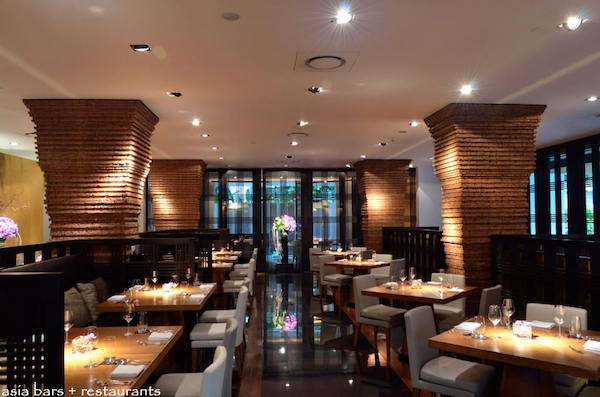 I was thinking where would be the BEST place for my guests and Nahm was my choice. I heard its’ reputation for a long time, but didn’t have a chance to visit myself so this was also a good opportunity for me to try my homeland’s cuisine at the only Thai restaurant on the global list. The meaning of Nahm is “water” (น้ำ /náam /). 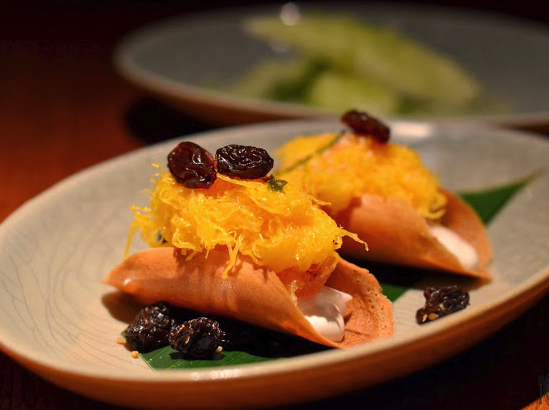 Nahm was founded by an Australian chef, David Thompson ,who has been living in Bangkok on and off since 1986, back in 2001 in the Halkin hotel in London, and in 2002 became the first Michelin-star Thai restaurant in Europe. In 2010, he opened a second branch of Nahm in Bangkok. 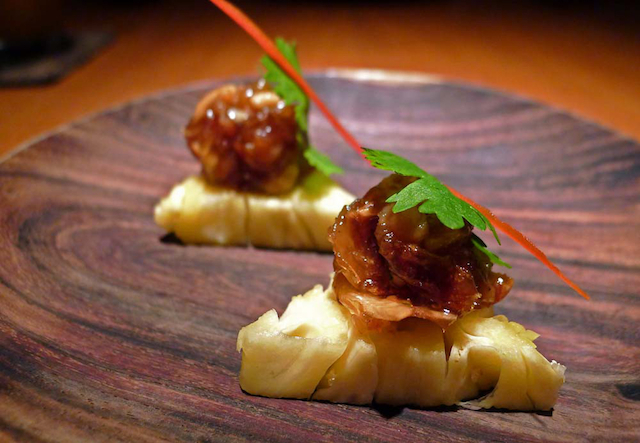 The restaurant was awarded the prestigious World’s 50 Best Restaurants 2013(Top 32) and Asia’s 50 Best Restaurants (Top 3). And on February 2014 Nahm was ranked No.1 in Asia’s 50 Best Restaurants 2014 awards in Singapore, earning the title of the S.Pellegrino Asia’s Best Restaurant. 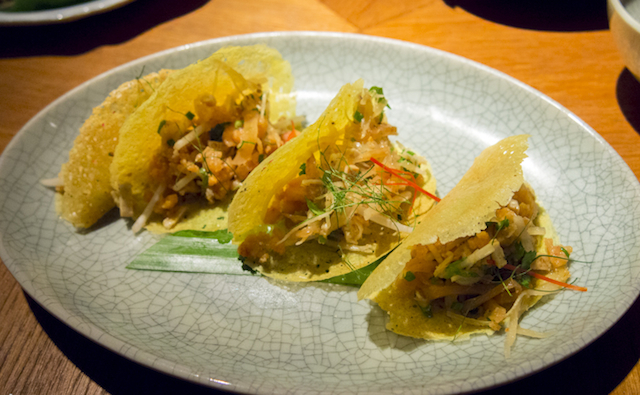 I was expecting to see traditional Thai style decoration, but Nahm has modern minimalist setting. There was a great vibe in the atmosphere with the restaurant being busy and bustling. We were led to the end of the hall behind the partition where it was a bit private (the main area of the restaurants looked very crowded, small tables lined up next to each other, I wouldn’t like that). I looked through the menu and was excited to see many dishes that I have never seen at any other Thai restaurants as well as some ingredients that I have never heard of. The restaurant caters food from every region in Thailand (Central, North, South and Northeast). As for drinks, they offer a large selection of wines, cocktails, mocktails and some Thai herbal drinks. There were four of us, and we decided to order the set menu that is based on the a la carte menu, it comprises of the selection of canapés (อาหารว่าง), a choice of one dish from each section of the main courses shared by the table which were one relish (เครื่องจิ้ม) , one salad (yam ยำ), one soup (per person), one curry (แกง) and one stir fried, steamed or grilled dish (ผัด นึ่ง ย่าง), followed by dessert. The portion sizes are determined by the number of people ordering the set menu. 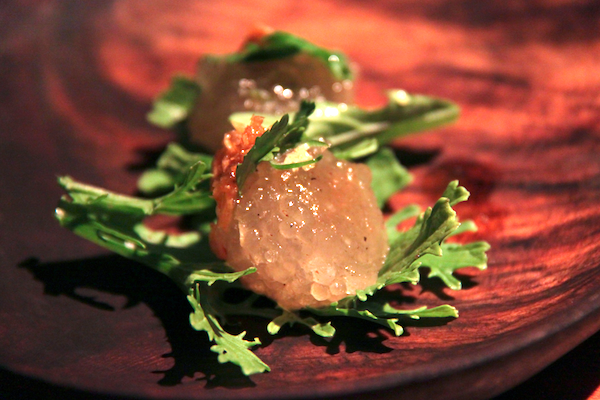 Before the canapés arrived, we were served a complimentary amuse-bouche called ม้าฮ่อ Ma Hor (‘galloping horses’). It is a traditional Thai appetizer that I am sure many Thai have forgotten about it or even never had it before. They are bites of pineapple topped with sweet pork, chicken and prawn paste. The paste was sticky and lightly sweet caramelized, with juicy sweet pineapple and hints of peanuts. Fresh coriander tie the two flavor together nicely. It was wow! The canapés were served one after the other and we were briefed to consume in a particular order in order to bring out the desired effect, preparing our palate for the mains to come. ขนมเบื้องญวณ Prawn and coconut wafers with pickled ginger. My favourite canapés out of the four was this prawn wafers. I had this wafer from street vendors before and I never liked it. It was always too bland or too salty, but chef David has done a great job, his wafer was amazingly tasty. สาคูไส้ปลาช่อน Smoked fish, peanut and tapioca dumplings. Tapioca dumpling is a common Thai snack that can be found on street side throughout Thailand, but it is usually stuffed with pork. The smoky taste of the fish was quite strong but it burst in my mouth wonderfully. 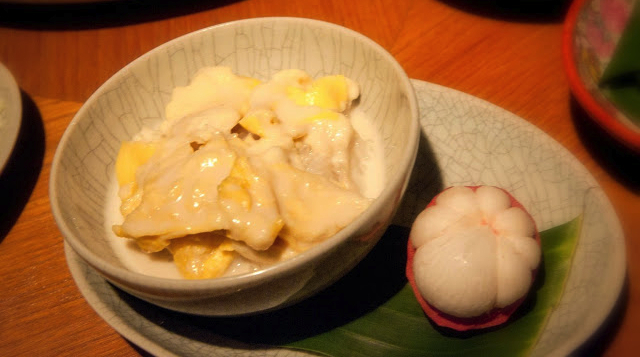 สาคูไส้ปลาช่อน Smoked fish tapioca dumplings. This dish is traditional Thai that is rare to find these days. I don’t remember if I have had it before. It was such a delicate dish. 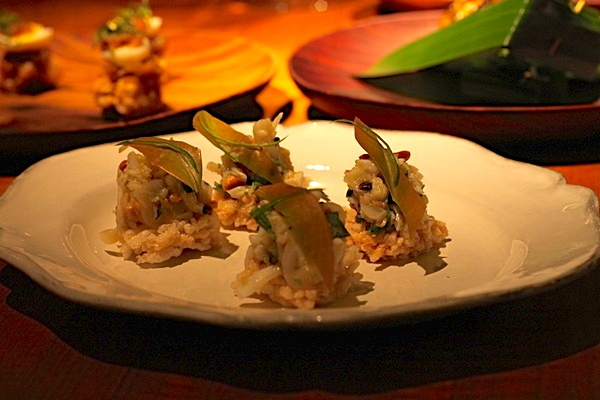 Blue swimmer crab on rice cakes. 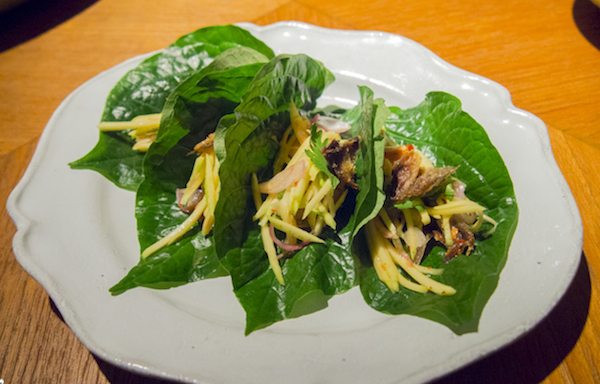 This Leaf-wrapped Tidbits (Miang Kam) is a traditional Thai snack. In the old times it was served only among members of the royal family. 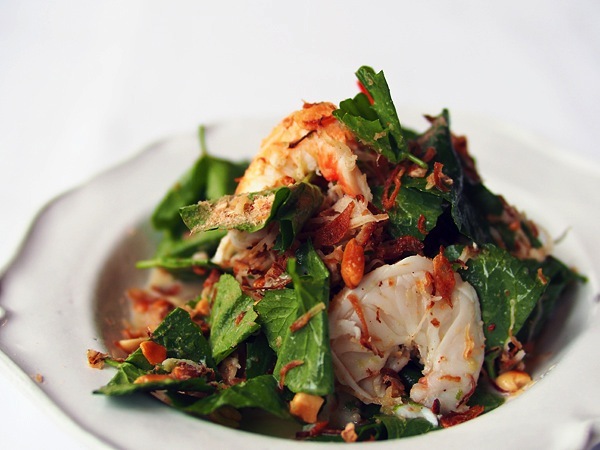 The usual Miang Kam’s recipe is using dried shrimp, but Chef David replaces it with salted fin perch. I found it very interesting. My foreign guests who had this dish for the first time also liked it, they described that while chewing the leave, the taste changed all the time. However, it unfortunately was a bit too spicy for them. Salted thread fin perch on betel leaves. One thing I noticed and really liked was the chef’s well thought out selection of plates used at the restaurant. They are lightweight, some are made of wood and some are made of Chinese glazed ceramics which is easy to be moved around (this is normal when eating Thai food, plates or bowls are being swapped from one corner to another). The rice served here is high quality aromatic jasmine rice from Surin province in Northeastern Thailand where they grow the best rice in the country and the world. My favourite of this meal was the duck soup. It was rounded and flavorful, and the young duck was tender. The fragrance of Thai sweet basil was aromatic. 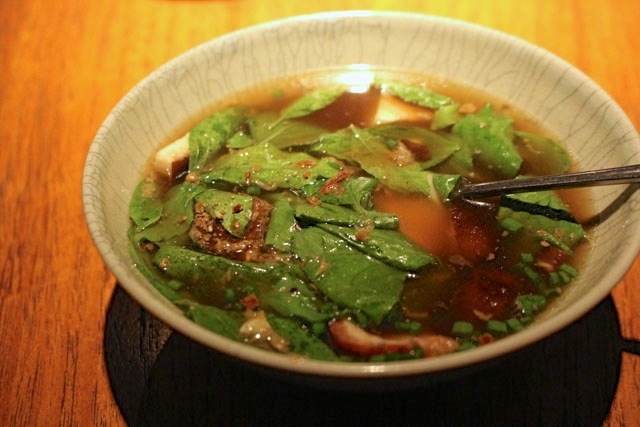 I think it was one of the best Thai soups I ever had! น้ำพริกถั่วผัด Peanut relish with grilled river prawns served with okra and baby corn poached in coconut cream. The river prawns were as fresh as they get, but I didn’t like the relish so much. It was quite bland for my liking. 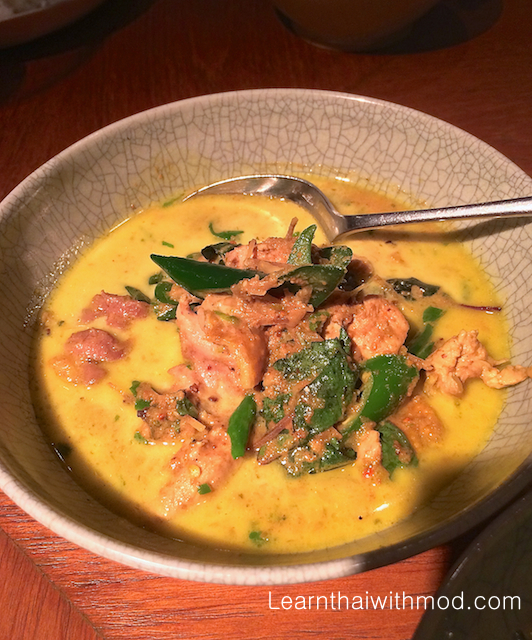 แกงกระทือไก่ต๊อก Guinea fowl curry with shampoo ginger and holy basil. This is my first time trying guinea fowl (ไก่ต๊อก). I even never heard of it before, as well as shampoo ginger (กระทือ). The guinea fowl was delectably tender. It was cooked in a creamy coconut based curry with a topping of finely sliced shampoo ginger which added much flavor along with the deep fried holy basil leaves. Unfortunately for my Scandinavian guests, they couldn’t enjoy this curry due to its spiciness (I also found it very spicy). After the first bite, they had to quickly swallow many spoonfuls of plain rice. Oh! poor them. Guinea fowl curry with shampoo ginger and holy basil. ปลาบู่ต้มกระชาย Bamboo fish braised with wild ginger and Asian celery. It is also my first time trying Bamboo fish. This fish is not very common in everyday Thai cooking. 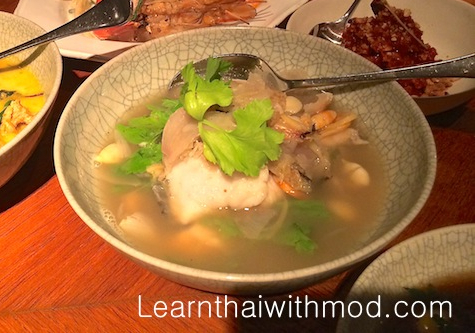 The bamboo fish was firm, plum and sweet, and the ginger and garnishes refreshes flavours of the soup. Completely a satisfying dish. Bamboo fish braised with wild ginger and Asian celery. I like salad that contains fruit, and I love mangosteen! so when I saw this dish on the menu, I wasn’t hesitate to order it. Fresh lobster and sweet mangosteen was a lovely combination. However, this was another too spicy dish for my foreign guests. I didn’t know it would be this spicy. I felt bad that they couldn’t enjoy the food as mush as they should. I actually would like to suggest the restaurant to add a mark on spicy dishes (a little chilli symbols after the name of the dish perhaps), it would be definitely helpful for many visitors who are not familiar with Thai cuisine. 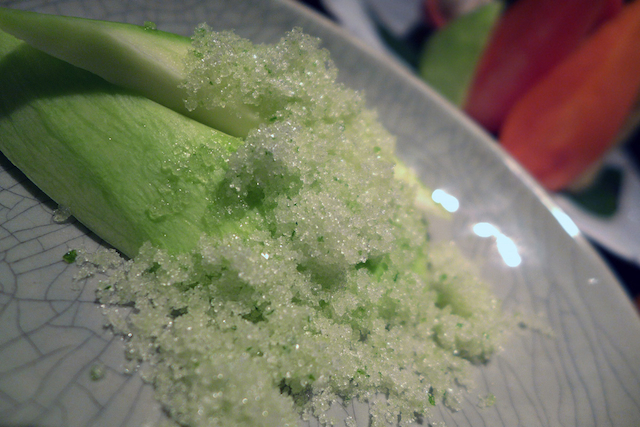 Before dessert arrived, we were offered the palate cleanser that was young green mango with salt and sugar with chili. 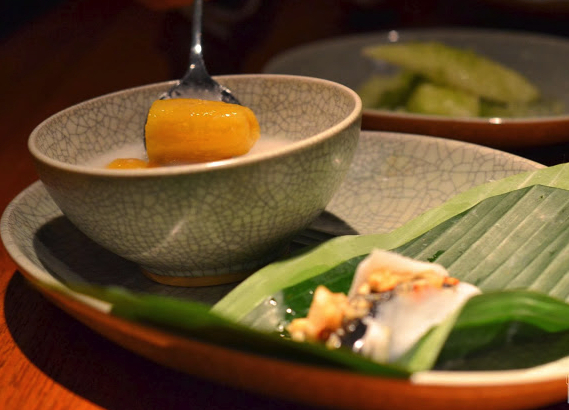 The desserts at Nahm are created by David’s partner of over 25 years Tanongsak Yordwai. I always leave room for dessert (to be frank, although there is no more room, I can always can find a room for it.LOL). Each of us ordered different dessert from the menu, so we got to try four different tastes. This sweet can be found on the street easily, I grew up with it. However, most street vendors tend to make it too sweet and very sugary. Nahm has brought this sweet to another level. It was entirely delicious! I love durian. Every year, when the durian season comes around, I need to get some of those king of fruit. This durian dessert was better than what I have tasted before. However, I am not a fan of durian with sticky rice. I prefer it fresh. My foreign friend loved it, he said it was the best Thai dessert in Thailand by far. The service was always attentive. Although the waiter who was serving us didn’t know much about wine, he brought his colleague in to assist us. I got some questions about the ingredients of the food and he explained it well. Over all, it was a very memorable meal for me. Dishes were interesting and high quality ingredients. 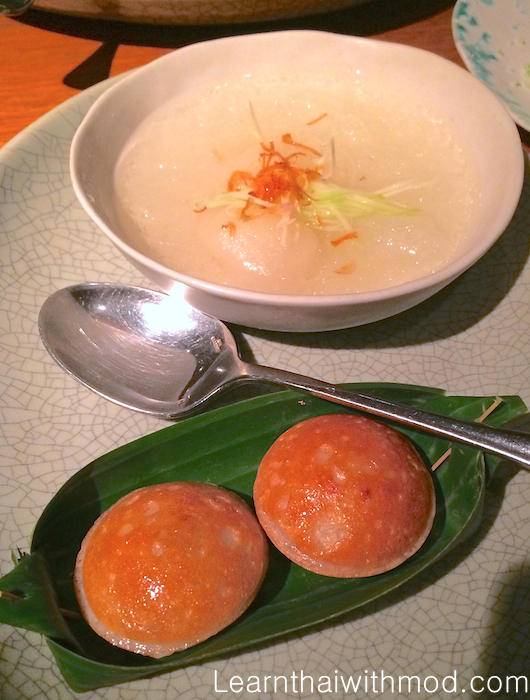 Most of dishes we ordered were too spicy for my guests, but they enjoyed the duck soup and the dessert very much. I would like to go back to try some other dishes ,for instance Coconut and Turmeric Curry of Blue Swimmer Crab with Calamansi Limes (แกงกะทิปูม้า) that I saw many reviews online said it was their favourite after coming back from the restaurant. It was not a cheap affair. The set menu is priced at THB 2,000++ with wine and drinks the bill came to about 5,000 baht per person. Definitely pricey for Bangkok, so I would save it for special occasions or entertaining out-of-town guests. At the start Nahm only offered dinner, now it is open for lunch. You can try the set menu which features 3 mains and 3 canapés along with dessert for only 1,100 baht. There is a smart casual dress code to be observed by the guests so for the gentlemen, unfortunately no shorts or slippers. Reservations are an absolute must here. It’s always booked out but lunch is a better option if you have left reservations until late. *Disclaimer: All food review are purely based on my own experiences and how I feel about the service, food and quality at the time of visit. It was not convenient for me to take photos of every single dish so I took some pictures from other websites. Thank you Mod, I am always looking forward to watching your precious info and valuable Thai lesson. 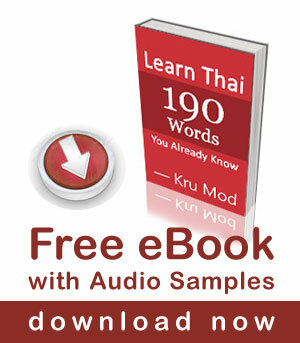 Thank you Mod, I am always looking forward to watching your precious info ans valuable Thai lesson. That was a very well-written and mouth-watering article you wrote! You should write more restaurant reviews! 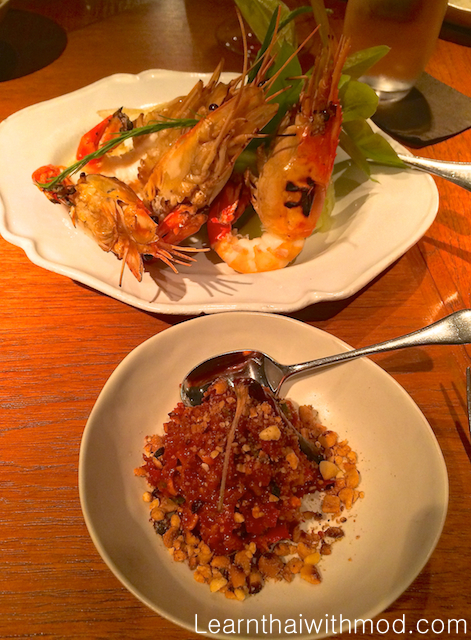 I went to Nahm in Hong Kong many years ago. I will have to try in Bangkok some time. Too many good restaurants too sample in Thailand, too little time. My favorite Thai dish? That is a most difficult question to answer. There are so many delicious Thai dishes, but I like all the versions of Tom Yum (ต้มยำ) soups best. I especially like the versions with fish (tom yum pla) or seafood (tom yum talay), but these are more difficult to find. And the best restaurant? That is actually very easy to answer! 🙂 It is of course the kitchen of my lovely Thai girlfriend. The dishes she makes are as tasty as she is pretty, because she cooks with love. 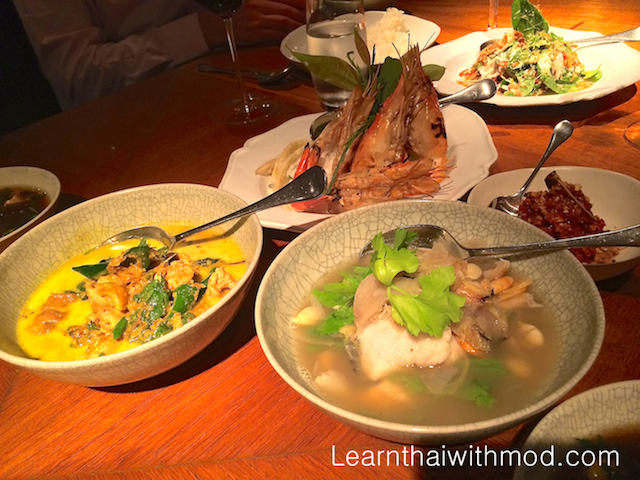 I will visit Nahm on my next trip to Bangkok. Sorry impossible to choose a favourite with options vast. Thanks for a sterling review.